Just had to quickly share this vintage-looking shaped card I made using the Lamp free cutting file I posted the other day. 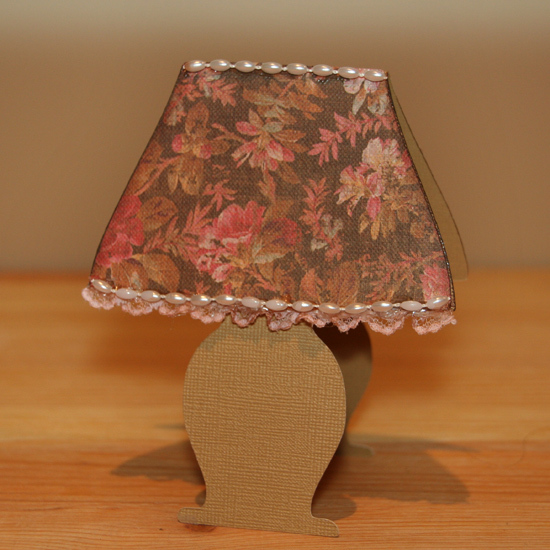 I used Bazzil cardstock for the base and paper from the Ancestry line by KB Company for the lampshade. Rather than the cut fringe, I decided to use a piece of real lace, and inked it a little bit with dark brown ink to grunge it up a bit. The finishing touch was a string of seed pearls across the top and bottom of the lampshade, and some dark brown inking along the sides of the shade. Finally, a new freebie up on the blog! 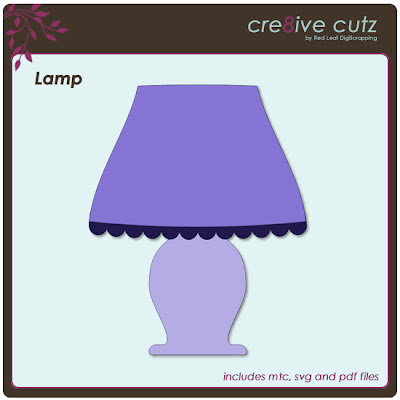 Feels like its been forever, but I finally got a new cutting file created for you, this versatile lamp. Use it on cards or scrapbook pages, or turn it into a card. The shade would look so pretty cut out of patterned paper, and the trim can easily be replaced by real lace for a vintage look. Just click on the preview image to download the files. As always, MTC, SVG and now PDF files are included in the free download. 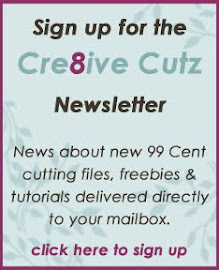 All files from Cre8ive Cutz, paid and free, cannot be resold or redistributed in any way. Feel free to alter them for your own personal projects, but please do not alter the files to reshare and claim as your own, whether you are giving them away or selling them. You may make items with Cre8ive Cutz files for sale or other commercial use including classes (including files downloaded under the former personal use agreement), as long as the digital pattern file itself is not redistributed or sold. If items are being made for commercial use, particularly classes, acknowledgement of Cre8ive Cutz as the pattern designer is appreciated. Photos of the projects that can be published on this website are always welcome as well. If you have any questions, please post a comment here or send me an email. Thanks. 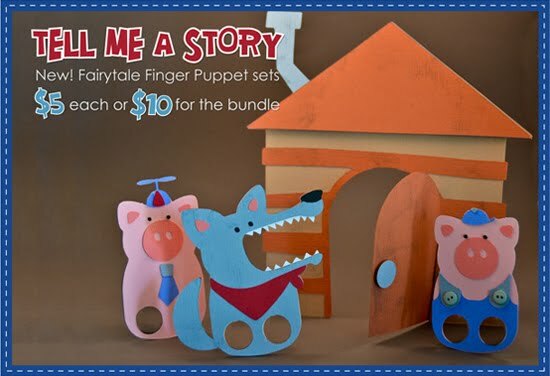 Entertain your little ones in style with these adorable new finger puppet sets; Goldilocks and the Three Bears, Three Little Pigs and Little Red Riding Hood. Each set is $5 or purchase all three for $10. Have you heard the news? New version of Make the Cut! is here and it's fantastic! Whew! I'm back from an amazing vacation in Europe, and while I was away the new version of Make the Cut! was released! 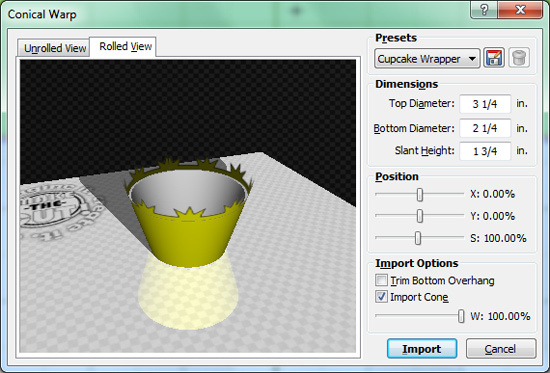 I haven't had too much time to play with it yet, but from what I've seen so far, it's got some great new features, I think my favorite so far is the conical warp that lets you create cupcake wrappers and travel cup inserts with ease. This is a quick screenshot of that feature. If you want to try out the new version, just click the Download link in the right hand column. Once I've had a chance to get a bit more organized at home, I'll be posting some videos of the new features, and of course some freebies for you. I've also got some great new purse cutting files in the works, so keep an eye out for those too!